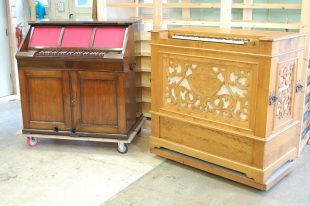 Edward has finished the restoration of a lovely little Snetzler bureau organ for the Handel House Museum. It was a gift from Elinor Warburg, and was originally made for a W.Macpherson, a member of the Abderdeen Musical Society, who bought it for £46. Nicholas Houghton’s organ we made in 1985, and it has now come back for a clean and overhaul.